“The nascent field of the social science of science policy needs to grow up, and quickly.” – J. Marburger, Science Advisor to the President, April 2005. As incredible as it may seem, science policy has few useful theories and no rigorous methods for assessing and improving the societal value of research. Public investments in science are almost always justified on the basis of desired social outcomes, yet we cannot even begin to answer questions about why one particular type or level of investment might be better than another for achieving a particular outcome. We cannot, that is, make even a rudimentary stab at determining whether our current research portfolio is anywhere close to optimal in terms of achieving the outcomes that society expects from it. Over the past several years, researchers in the CSPO network have begun to develop some theoretical foundations, and to devise some analytical methods, aimed at what ought to be the driving question in science policy: How do we know if we are doing the right research? 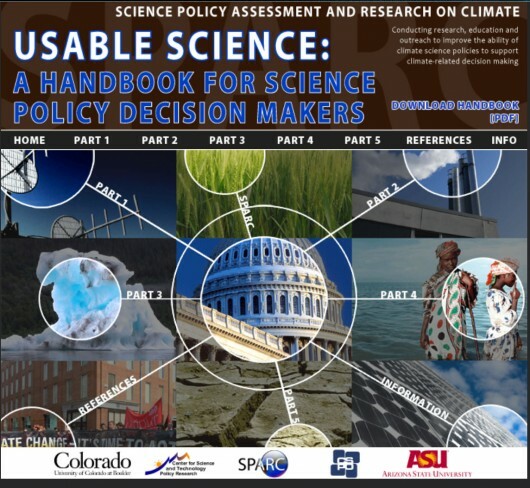 The work compiled and presented here (some published in the peer-reviewed literature, some still unpublished) is no more than the smallest first step toward defining a new agenda for science policy research and practice. It represents CSPO’s answer to Dr. Marburger’s charge: a preliminary and inadequate answer to be sure, but, we hope, a foundation for the future. Bozeman, B. (2003). Public Value Mapping of Science Outcomes: Theory and Method. In D. Sarewitz, et al., Knowledge Flows & Knowledge Collectives: Understanding the Role of Science & Technology Policies in Development, 2(1). An approach to assessing if a research program is potentially capable of meeting the societal goals that justify it. Bozeman B., & Sarewitz D. (2005, April). Public values and public failure in US science policy. Science and Public Policy, 32(2), 119-136. Non-economic criteria for considering if research is furthering societal goals. Garfinkel, M.S., Sarewitz, D. & Porter, A.L. (2006, March). A Societal Outcomes Map for Health Research and Policy. American Journal of Public Health, 96(3), 441-446. A tool for choosing among competing alternatives in pursuing particular social outcomes. Guston, D. & Sarewitz, D. (2002). Real-Time Technology Assessment. Technology in Society, 24(1-2), 93-109. A multimethod approach for creating a capacity to guide research toward socially desirable goals, and away from undesirable ones. Sarewitz, Daniel and Roger A. Pielke, Jr. 2007. “The neglected heart of science policy: reconciling supply of and demand for science.” Environmental Science and Policy, 10(1): 5-16. Theory and method for assessing if research programs can provide useful and useable information. Sarewitz, D., Foladori, G., Invernizzi, I., & Garfinkel, M. (2004). Science Policy in Its Social Context. Philosophy Today, 2004 Supplement, 67-83. An approach to thinking about the logic of science policy decisions. New Essays on Science Policy: As part of its planning process for a new program on the social science of science policy, the National Science Foundation recently convened a workshop on the Social Organization of Science and on Science Policy. CSPO’s David Guston, Clark Miller, and Dan Sarewitz all participated and contributed framing essays.